We gather for worship on Saturday evening and on Sunday Morning. We are old. We are young. We are middle aged. Some are married, some are single. Many of us have come to the Orthodox Church after years of searching. The Orthodox Church is the historical Church, which was founded on the day of Pentecost in Jerusalem and spread throughout Judea and finally the world. In our services we celebrate the great truths of the Christian Faith. Holy Trinity Cathedral is named after the Godhead; God the Father, God the Son and God the Holy Spirit. This is particularly significant in that the Trinitarian understanding of the Godhead based upon the revelation of God, is uniquely Christian. The Orthodox Church has often been referred to as “the Church of the Holy Trinity” because of her commitment to the critical necessity of maintaining the Trinitarian faith. If God is One yet Three Persons as He has revealed Himself to be, and if we are created in the image and likeness of God, then understanding and living out this Trinitarian nature is critical to our life and faith. What is Holy Trinity Cathedral? Holy Trinity Cathedral is a community of Orthodox Christian believers, or parish. Our parish is called a “cathedral” because it is the episcopal headquarters of the Bishop of San Francisco and the West. We are part of the Diocese of the West of the Orthodox Church in America. Established in 1857, San Francisco is the oldest Orthodox community in the contiguous United States. The present temple was built in 1909 to replace an earlier church destroyed by the 1906 earthquake and fire. Down through the years the Cathedral has been the fortunate recipient of the generosity of many. For example, our bells were donated by Tsar Alexander III of Russia in 1888. 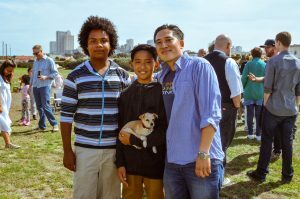 Located in beautiful San Francisco, California, Holy Trinity Cathedral is a community of Christians who gather to offer praise and thanksgiving to God in the tradition of the Orthodox Christian Church. We fulfill a special ministry as the episcopal see of the Bishop of San Francisco and the West in the Orthodox Church in America. Our parish is led by our hierarch, His Eminence Benjamin, Archbishop of San Francisco. Our dean, or pastor, is Father Kirill Sokolov. 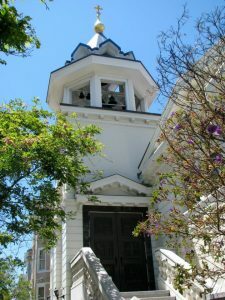 Holy Trinity Cathedral is located at the corner of Van Ness Boulevard (Highway 101) and Green Street in San Francisco’s historic Russian Hill neighborhood just eight short blocks from Aquatic Park, Ghirardelli Square, and the Bay. Why is Orthodox Worship so unique? Worship in the Orthodox Church brings the whole person — mind, body and spirit — into an awareness of the presence of the Kingdom of God. While one’s first impression upon entering an Orthodox temple may be that it is full of symbols of the faith (icons, stained glass, architectural elements, etc.) these are in fact more than mere symbols: they signify and present spiritual realities into which we may enter. Along with the Divine Liturgy, the Church building bears testimony to a living continuity with Judaic worship and early Christianity. Of significance is that the worship of the Apostles and followers of Jesus Christ was a modified version of Jewish synagogue and Temple worship. Synagogue worship structure consisted of a litany of prayers, a confession, eulogies, reading from the Scriptures, a homily (sermon) and a benediction. The worship in the Temple in Jerusalem was characterized by the altar upon which were sacrificed offerings to God for the forgiveness of sins. The Good News (Gospel) of Jesus Christ replaced the sacrifices in the Temple with His sacrifice on our behalf, experienced through the ongoing participation in Holy Communion (the Lord’s Supper). Synagogue worship took place in a simple building with a raised platform from which the Rabbi taught, an Ark in which the Scriptures were kept, and a veil which covered the Ark and before which a seven-branched candlestick burned. For the early Christians who continued the practice of Jesus Christ, the synagogue order with added elements of Temple ritual became the normal form of worship. Indeed, the Orthodox temple appears as a Christianized version of a Jewish synagogue. The most visible difference between Byzantine church architecture and that of Western Christianity involves the use of icons. Icons were already in use in the Catacombs of Rome, and were a normal aspect of all Christian worship prior to the Great Schism between East and West in 1054 AD. After that time, iconography started to fall into disfavor in the West, being replaced with more portrait-like and naturalistic religious paintings or statuary. In the East, the use of icons continued as it had been from generation to generation. The New Testament teaches that Jesus Christ was an image (in Greek, icon) of the Father (John 14:9), and the Orthodox faith cannot be fully understood and appreciated until and unless one understands its icons. Holy Trinity Cathedral, like most Orthodox Churches, is filled with icons. An icon is an image of Christ, His Mother, a Saint, or an event in the life of the Church in the history of salvation. Icons may be executed in mosaic, on wood panel, or in large flat scenes called fresco. Holy Trinity Cathedral also possesses beautiful images wrought in stained glass. An icon is not merely decoration or a religious painting, but a holy presence, teaching the truths of the Orthodox faith, helping guide and focus the attention of the faithful. God became flesh in the person of Jesus Christ (John 1:14), assuming all the characteristics of mankind. 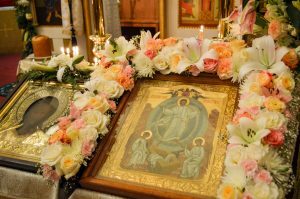 The fact that God created matter states that it is good; the fact that in Christ he appeared among us in incarnate, material form affirms the validity of using icons in worship. People gather in the temple and stand with reverent and eager expectancy. The vestments of the clergy and servers as well as the candles and the incense all speak of the Kingdom to our senses of sight and smell. Orthodox worship involves the whole person with all his senses, not just the mind. From this festal atmosphere of fragrance and color comes the singing of the choir leading the congregation in worship. Some of the most beautiful and powerful music ever written is sung right here in our little church. Since our faith is rooted and grounded in Holy Tradition, our worship services don’t get sidetracked in the fads and fancies of the day. There is a stability and a constancy that brings the human heart to the Gates of Heaven. The worshipers discover ancient truths, ever fresh and relevant, giving strength and hope to our modern world. We invite you to visit and worship with us!